** ONE OWNER **, **SERVICE RECORDS AVAILABLE**, **CD PLAYER**, **REMOTE KEYLESS ENTRY**, **GUARANTEED FINANCING AVAILABLE**, **A+ Better Business Bureau **. CARFAX One-Owner. 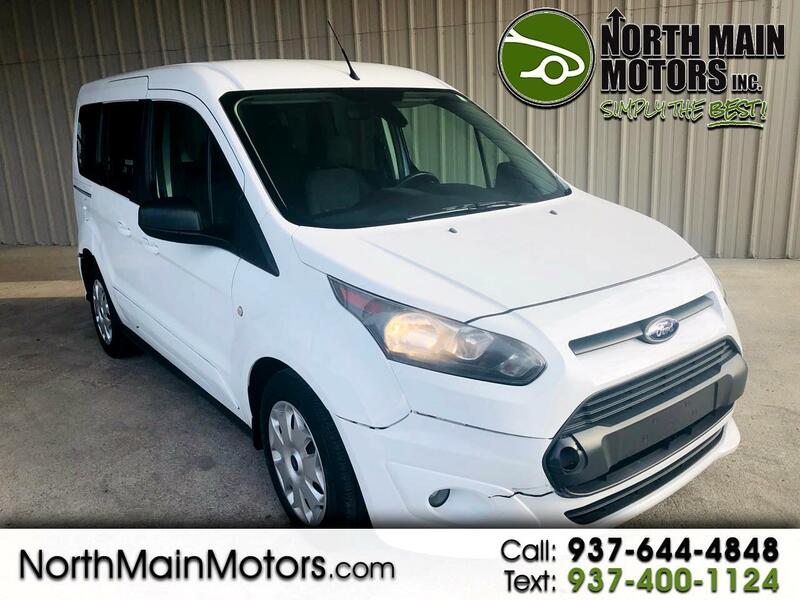 North Main Motors is proud to offer this gorgeous-looking 2015 Ford Transit Connect XLT In White. This vehicle is beautifully equipped with 16" x 6.5" Steel Wheels w/Full Wheel Covers, 3.21 Axle Ratio, 4 Speakers, 4-Wheel Disc Brakes, ABS brakes, Air Conditioning, AM/FM radio, Bodyside moldings, Brake assist, Bumpers: body-color, CD player, Cloth Front Bucket Seats, Driver door bin, Driver vanity mirror, Dual front impact airbags, Dual front side impact airbags, Electronic Stability Control, Exterior Parking Camera Rear, Front anti-roll bar, Front Bucket Seats, Front Center Armrest w/Storage, Front fog lights, Front reading lights, Front wheel independent suspension, Heated door mirrors, Illuminated entry, Low tire pressure warning, MP3 decoder, Occupant sensing airbag, Outside temperature display, Overhead airbag, Overhead console, Passenger door bin, Passenger vanity mirror, Power door mirrors, Power steering, Power windows, Radio data system, Radio: AM/FM Stereo w/Single CD & Rear View Camera, Rear anti-roll bar, Rear fog lights, Rear seat center armrest, Rear window defroster, Rear window wiper, Remote keyless entry, Speed control, Split folding rear seat, Steering wheel mounted audio controls, Tachometer, Telescoping steering wheel, Tilt steering wheel, Traction control, Trip computer, and Variably intermittent wipers! Reviews: * With its sleek and stylish exterior, the Transit Connect exudes a professional image. Open the door. Accommodating seats available in a variety of fabrics and available amenities make for a very comfortable interior. The Transit Connect - smart looks and smart features make this a smart choice. The Transit Connect is designed to help you work smart. Long- and short-wheelbase choices allow you to select the model that meets your business needs. Large side panels let you display your company name and graphics. Side and rear cargo door choices provide loading/unloading options, while fold-flat seats in the long wheelbase wagon let you carry passengers and/or cargo. Available SYNC and SYNC with MyFord Touch allow you to access vehicle functions using simple voice commands. There are even available features that can aid you with parking. The hardworking, Built Ford Tough Transit Connect is designed to do what you demand of it. It has a payload of up to 1,650 lbs. (van) and more than 130 cu. ft. of storage room behind the front-row seats. When properly equipped, it can tow up to 2,000 lbs. There's another side to this vehicle, the wagon can carry up to 7 passengers with the available 3rd-row seat. The front-passenger seat (on select models) and rear seats can fold down for storage room when not being used for passengers. The small turning radius also makes it the ideal urban work vehicle. The Transit Connect features two engines new for the Transit Connect, the standard 2.5L Duratec engine and the available 1.6L EcoBoost engine, both of which deliver an efficient performance. If you want to operate using compressed natural gas or liquefied petroleum gas, the Transit Connect can be equipped with the CNG/LPG Gaseous Prep Package. Source: The Manufacturer Summary From the moment you step on our lot until the time you drive away in your next car, your buying experience with North Main Motors is our number one priority. We encourage you to use the expertise and resources of our sales staff - they are here to help you find the right car at the right price. Call us today at 937-644-4848 to schedule your test drive!